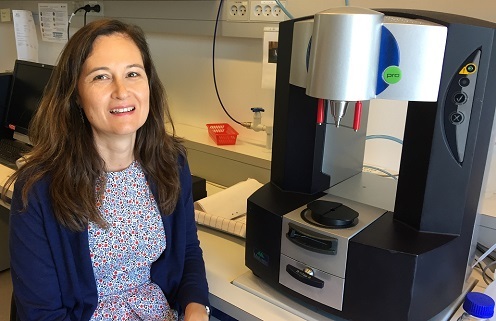 The Department of Food Science at the University of Copenhagen is taking part in a new research collaboration that aims to use 3D printing technology to tailor meals for individual hospital patients without the need for additional resources in the hospital kitchen. Professor of dairy process technology Lilia Ahrné from the Department of Food Science at the University of Copenhagen. The research collaboration aims to create customised meals for patients using 3D printing technology and newly developed ingredients. The meals should have the correct nutrition and energy content in relation to the individual patient's needs and will also be adapted to the patient’s wishes for taste and consistency. The project partners expect that 3D printed meals will make it possible to supplement the medical treatment with a customised nutritional treatment for hospital patients, and at the end of the project the concept will be tested at Aalborg University Hospital. “The core point is that 3D printing technology can be used to produce tailored meals. This is of great importance, because each patient needs a particular diet, both in relation to his or her disease and nutritional requirements as well as adapted to their taste preferences,” stated the professor of dairy process technology Lilia Ahrné from the Department of Food Science at the University of Copenhagen. Three sections at the Department of Food Science are taking part in the research collaboration: Design and Consumer Behaviour, Microbiology and Fermentation, and Ingredient and Dairy Technology. “FOOD contributes to the project with our knowledge of sensory science, including taste and texture, with our knowledge of microbiology in relation to food safety and with our knowledge of dairy process technology. I believe dairy can provide relevant ingredients for 3D printing – e.g. ice cream, which is easy to eat and can also be easily adapted to provide high nutritional value, which could be important for many patients,” continued Lilia Ahrné. What is your personal role in the project? “My personal role is to understand how dairy ingredients behave and can be controlled when used in a 3D printer. The printer is equipped with a number of cartridges that contain the different food ingredients to be 3D printed as a meal. This is a new type of food processing, which we still do not know much about. We will look at what kind of changes the ingredients will be subjected to during the printing process and how they influence, e.g., taste and texture,” explained Lilia Ahrné. She expects the project to be only the beginning of a lot of research involving 3D printing of food. “The potential for 3D printing of food is very large, as the tendency for personalised food that we are already seeing will grow in the future,” she stated. The project title is: 3P – Personalised food Products for Patients. The 3P project aims to develop 3D technology to revolutionise hospital kitchens and give patients the opportunity to enjoy meals that are customised for their individual needs. Innovation Fund Denmark has invested 14 million Danish kroner in the project and the total budget is 20 million Danish kroner. The project began on 1 September 2017 and will run for four years.